that is hilarious! you gotta give her credit for trying. I can not stop laughing and can’t get a hold of Troy (out of town) to tell him. We have 2 very persistent girls trying to get the passwords to log on, I ‘m impressed! LMAO!!! This is really a funny post. Poor Brian & Julie. If they are already forging names you just wait when they are “actual” teenagers and really learn to manipulate. This was actually a pretty decent first try. I can’t wait to see what they come up wit next. Good luck! Your children are appealing to the wrong part of the family. Don’t they know that their Aunt Susi is a ringer for the sympathy card? All I need is a plea. Love you guys and support what you are doing. What is the baby’s name by the way? Steven Seth or Brian Henry? Jason and I were rolling. And believe me, it CAN get worse than Webkinz! 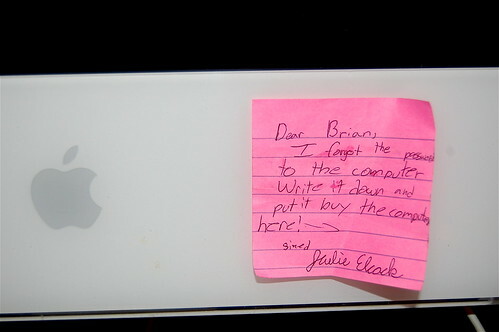 LOL The note is perfect!!!! I am sure our kids will be doing this same thing someday. I’m afraid my handwriting looks like that, so I bet Clark would have just filled in the password. Okay he’s too smart, but seriously it’s only cause she didn’t sign it “love ya” or something more romantic than “sined.” Don’t they know the pet names? Awe..so cute. Definitely one sticky for the scrapbook. Miss you guys! Previous Previous post: Potty Training is EXHAUSTING when you are very pregnant!